A 13-part webinar series introducing PanelingTools from the basics to full practical examples that will help you put it all together. Rajaa Issa, chief architect of Rhino's PanelingTools plug-in shows how to use PanelingTools to develop pattern concepts. She also demonstrates the basics of using PanelingTools for parametric modeling with Grasshopper. This is the full presentation given by Rajaa Issa during the D-O-F (Design+Optimization+Fabrication) workshop at the University of Florida on February 11, 2011. The presentation is broken into three parts. The first shows surface rationalization and unrolling. The second explores cladding and the third shows a weaving example. You can also download example files used in the presentation (3DM Files, 24MB). 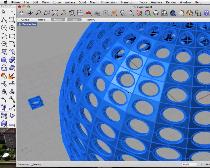 Four tutorials from Rhino tech tips by Brian James. 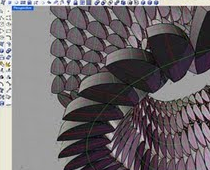 Three tutorials from Generative Design Computing blog by Glenn Wilcox. View details. Rhino for Mac tutorial to populate patterns. View details.